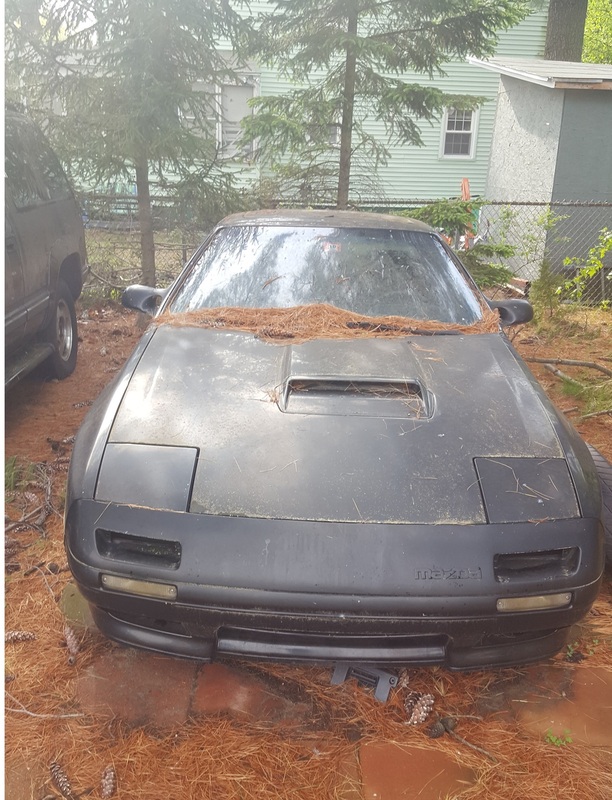 I’ve been planning to start work on the RX-7, but first I needed to clear another project out of the garage. I have a Honda Nighthawk 650 with a bad ticking noise coming from the top end of the engine. 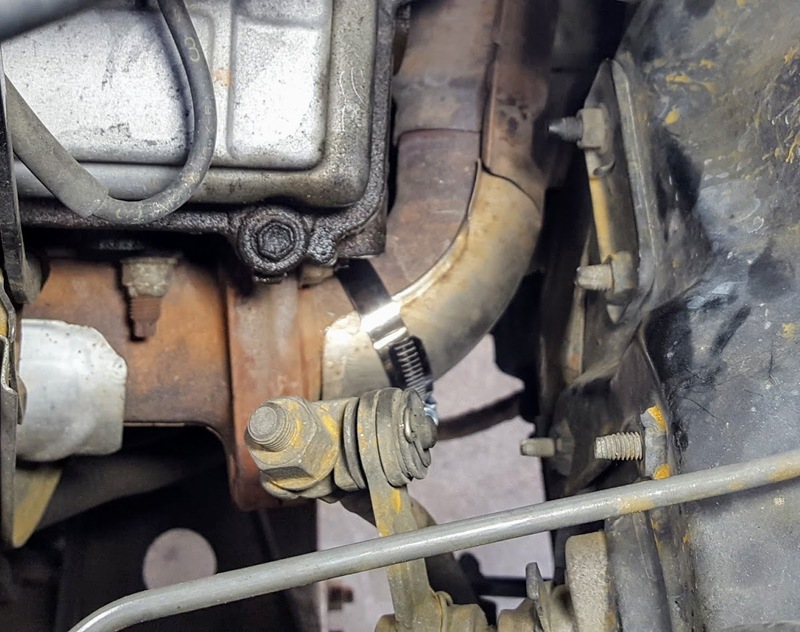 It sat for a while before it developed the noise, so I was pretty sure air had made it’s way into one the of the hydraulic tappets. The fix was easy, but getting to the tappet meant pulling the valve cover as well as the upper part of the bike. I made a short video for anyone else who runs into the same problem, finding the right procedure to bleed the tappet was hard to find on youtube. 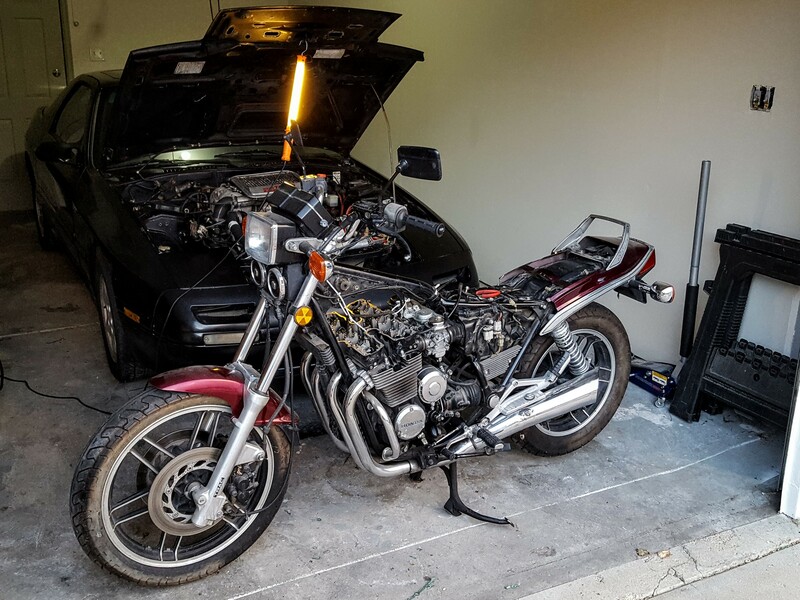 Now that the bike is back together and running great, I’m out of excuses to avoid working on the RX-7. First up is the roof, body work supplies are already starting to arrive. The road trip was a success and the RX-7 is back in Colorado! And more importantly, the T100 didn’t self destruct on the drive. The dolly turned out to be the right choice, the extra weight of a full trailer would have been a struggle once the T100 started gasping at higher elevations. Even with the lighter weight there was a moment in Iowa when the A/T Temp light came on, though that might have been down to user error. Overdrive had been working well earlier in the trip, but something about the heat, elevation, or gradual upward grade kept the torque converter from locking in 4th gear on that stretch of road. Turning off overdrive brought the temp back down for the rest of the drive. It was a miserably long drive, but it was worth it to drag the RX-7 into a car wash for the first time in nearly a decade. The mold washed right off and it’s now looking like the car I’ve been daydreaming about since I was 19. For a full walk around of the car, see the video embedded below. The first step, which will take a while, will be addressing the body damage and rust. 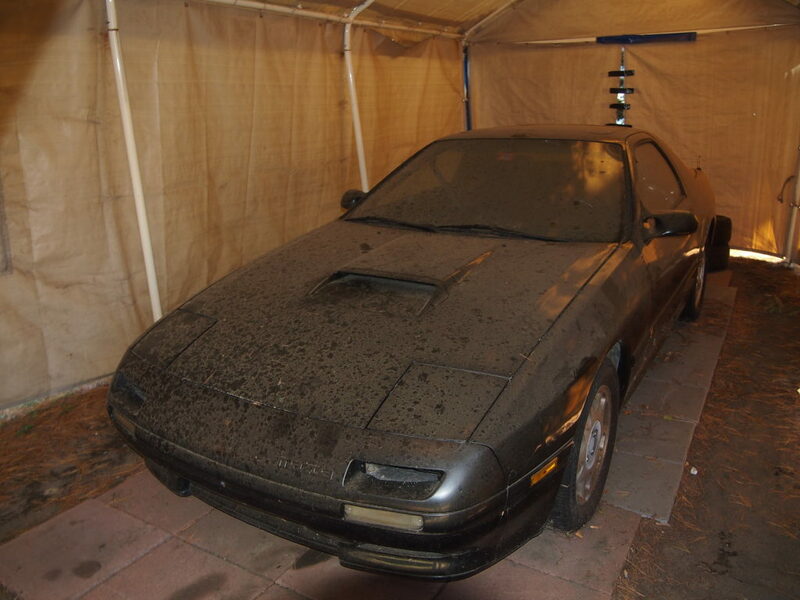 So far everything looks fixable, though fixing the paint will eventually mean a full respray. For now that’s in the distant future and hopefully I can get away with spot repairs in the short term. 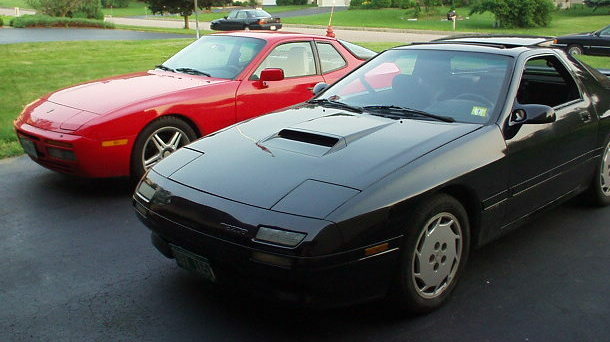 This weekend I’ll be heading out on a 4000 mile road trip to tow back the Rx-7. The truck has been running well, but it’s as good an excuse as any to finish up some of the projects I’ve been putting off. The first has been sorting out the electrical system in the bed. I had a spare battery in back when I had the camper in place, but with the topper installed the battery is now in the “living” area. Instead of trying to rig up a sealed box and external vent, I’m planning on moving the second battery under the hood instead. That will require building a new battery tray, so in the mean time I just ran power back from the main battery to a fuse panel and removed the second battery entirely. I’ll have to be careful not to kill it, so for the moment it’s only powering a light and cigarette lighter socket, a fan and inverter will have to wait. 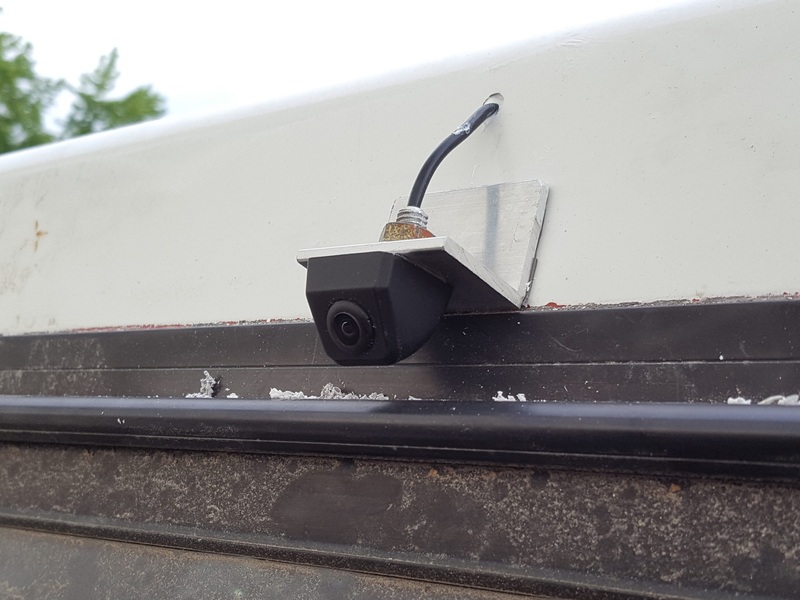 While I was messing with the wiring, I installed the backup camera I bought a while back to replace the one that left with the Four Wheel Camper. It was another cheap ebay camera, however this one must have been meant to mount under a bumper or other lip. I made a mount out of a spare piece of aluminum, but the angle still isn’t great. I’ll see how it works on the trip, but I may end up replacing it. Next on the list was to build a shelf over the front part of the bed. 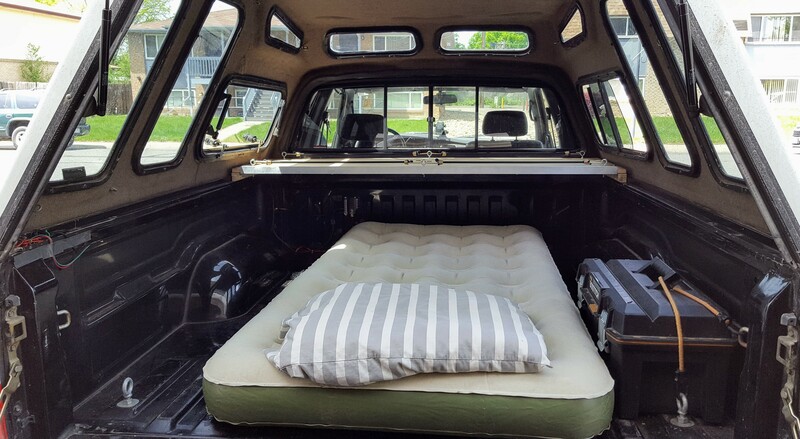 The idea is to have a place to store camping gear while leaving space for a mattress underneath. I considered a platform with drawers instead, but decided to go for something simple this time. I made it out of 5/8″ plywood with an aluminum L channel to brace the front. I think it came out pretty nice. With the slope of the cap, it’s a tight fit between the bed rails and won’t be coming out any time soon. But so far it looks like it’ll work to keep everything out of the way. 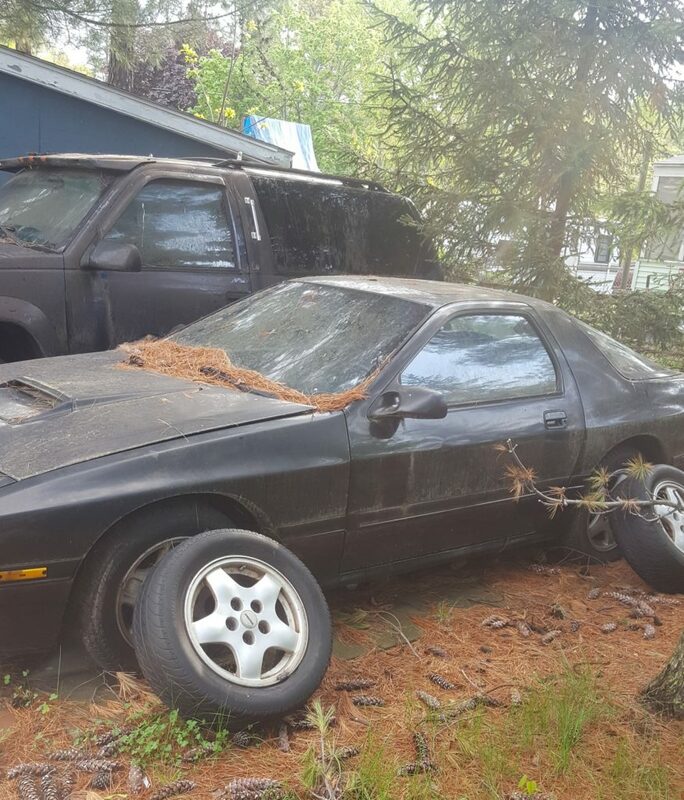 I’ve been planning a trip back East to retrieve my RX-7, however the big unknown has been the condition of the car. I parked it six years ago under a car shelter, which then proceeded to collapse after a heavy snow. I visited it fairly soon after that happened and pulled the destroyed shelter off of it, but it’s been out in the elements and I’ve been across the country since then. I’ve been renting out the property it’s parked on so it hasn’t been easy to get updates on it. So I was excited to finally receive these pictures from the property management company. At first glance it still looks like it’s in one piece. 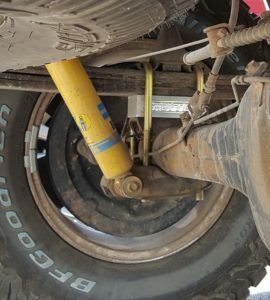 I think I can even convince myself the tires are still holding air. The spare two next the car were in storage and had new-ish tires on them when I parked it. With any luck they’ll be in decent enough shape so I can use a dolly to haul the car back instead of requiring a full trailer. Here’s another picture from the front, though it doesn’t show much more detail other than the desperate need for a wash.
All in all it looks fairly similar to how it did when I parked it. It wasn’t the cleanest then either. Continuing to fill in the gaps to the CarBIO listed off to the left. This time around it’s the Lincoln Mark VIII. 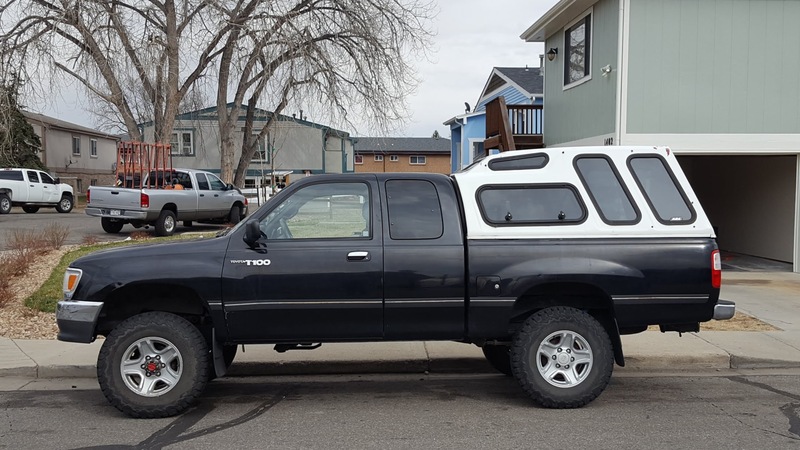 It came off of a 270k mile T100 and needs some maintenance, but it has some great features for a camper shell. 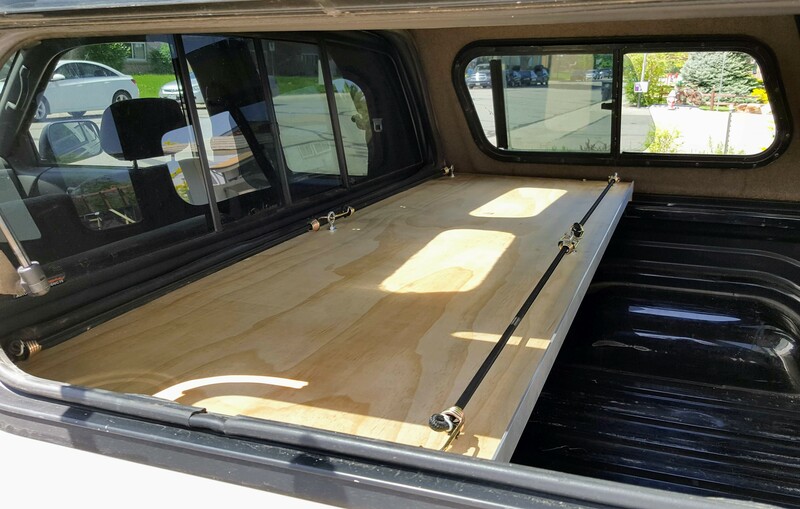 Came with a carpeted interior, compression boot where it meets the cab, hinged window on the left, and a slider on the right. The downside to it is the height. I had hoped for a flush shell, but for $200 I can’t complain. I also need to do something about the paint. At a minimum the white paint needs to be touched up, but I’m considering a full repaint to match the truck. Would look better, but I might regret it in the heat. There’s a new page on the left covering the Mazdaspeed 3 I bought back in 2007. I was terrible at taking pictures back then, but I did manage to dig up a couple old track day videos, be sure to check them out. I’ve been living full time out of the Phoenix camper for the last few months, but with winter on the way I’ve settled back into an apartment. Since it wasn’t looking like I would get much of a chance to use the camper next year, I decided to sell it and go with something lighter weight for the T100. Should also mean a return of the trail videos. While the T100 was still fairly capable with the camper on the back, it never felt stable enough to really push the truck off-road. The buyer loaded it onto a four door 2nd gen Tacoma, which handled the weight and size surprisingly well. While I’m sad to see it go, with cash in hand I’m already planning the next upgrades to the T100. Bumper, sliders, winch or is it finally time for a locker? When I installed the 2″ lift kit, the final ride height measured out a 1/2″ higher in the rear than in the front. 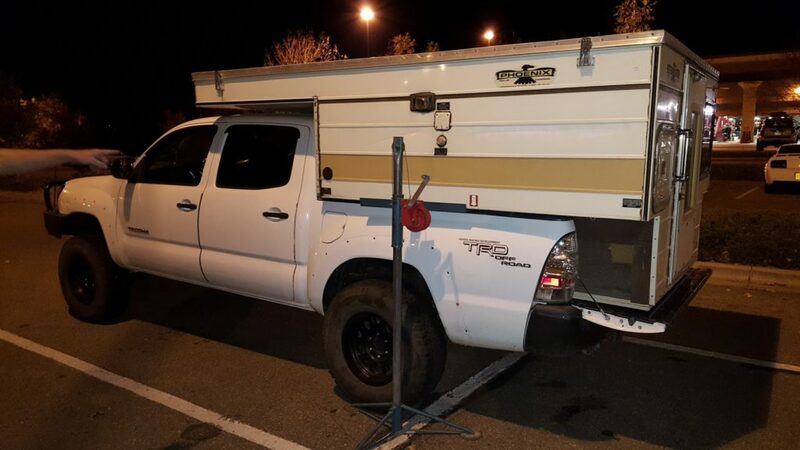 Since I knew the camper was going back on I left it as is and guessed I would see about 1″ of sag in the rear which would keep things roughly lined up. It turned out to be a bit more than that. The total sag came out to 2″ in the back, more than enough to be noticeable. I debated adding rear air bags, but I was quoted >$600 to get them installed. The parts cost was less than half that, but since I’m living out of the camper for the next few months, I’m stuck without a good place to work on the truck. 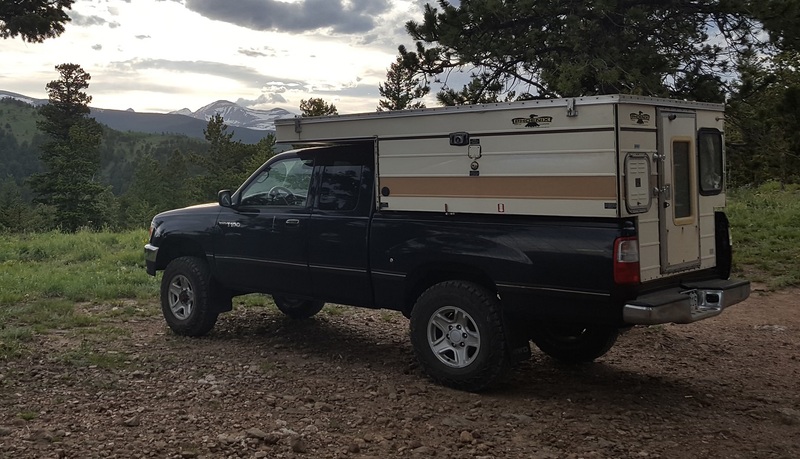 A lift block looked like a much easier installation and I was reasonably sure I could do it myself at a campsite. Toytec offers a 1.5″ block, so I grabbed a pair along with a set of 9″ u-bolts. The end result came out just about perfect. Air bags might have been nice for the adjustability, but I can’t complain about the simplicity of this set up.